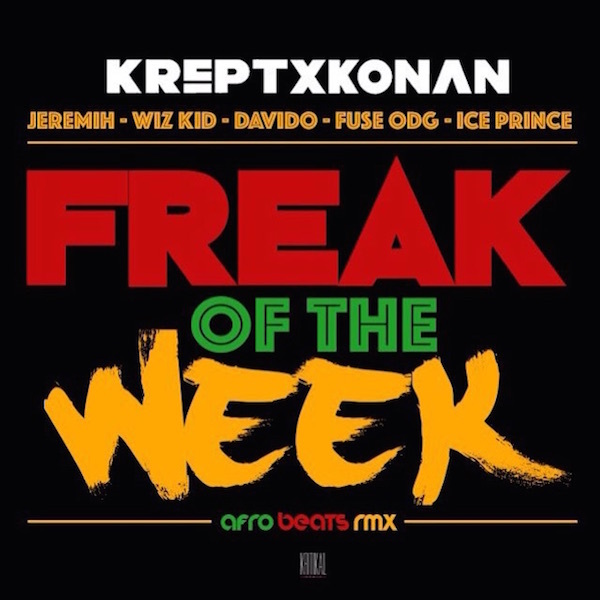 Krept & Konan ft. Jeremih, WizKid, Davido, Fuse ODG, Ice Prince - "Freak of the Week (Afrobeats Remix)"
A crew of rapping and singing talents come together for a transatlantic posse cut, the Afrobeats remix of “Freak Of The Week.” Twenty-something Londoners Krept & Konan already had a bass and chant-driven radio-ready hit on their hands. The song followed the “Don’t Tell Em” formula, culminating the accessibility of DJ Mustard and Jeremih for a a stab at the song-of-the-summer title. Now, they’re showing love to other buzzing acts deserving of a major look. WizKid, a South African crooner we previously highlighted, joins Ice Prince, Fuse ODG, and Davido. The track only benefits from the addition of interesting voices.